Machine Learning, Computer Vision, and Artificial Intelligence. Dhruv Batra is an Assistant Professor in the School of Interactive Computing at Georgia Tech and a Research Scientist at Facebook AI Research (FAIR). 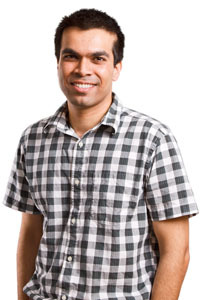 His research interests lie at the intersection of machine learning, computer vision, natural language processing, and AI, with a focus on developing intelligent systems that are able to concisely summarize their beliefs about the world with diverse predictions, integrate information and beliefs across different sub-components or `modules' of AI (vision, language, reasoning, dialog), and interpretable AI systems that provide explanations and justifications for why they believe what they believe. He is a recipient of the Office of Naval Research (ONR) Young Investigator Program (YIP) award (2016), the National Science Foundation (NSF) CAREER award (2014), Army Research Office (ARO) Young Investigator Program (YIP) award (2014), Virginia Tech College of Engineering Outstanding New Assistant Professor award (2015), two Google Faculty Research Awards (2013, 2015), Amazon Academic Research award (2016), Carnegie Mellon Dean's Fellowship (2007), and several best paper awards (EMNLP 2017, ICML workshop on Visualization for Deep Learning 2016, ICCV workshop Object Understanding for Interaction 2016) and teaching commendations at Virginia Tech. His research is supported by NSF, ARO, ARL, ONR, DARPA, Amazon, Google, Microsoft, and NVIDIA. Research from his lab has been extensively covered in the media (with varying levels of accuracy) at CNN, BBC, CNBC, Bloomberg Business, The Boston Globe, MIT Technology Review, Newsweek, The Verge, New Scientist, and NPR.